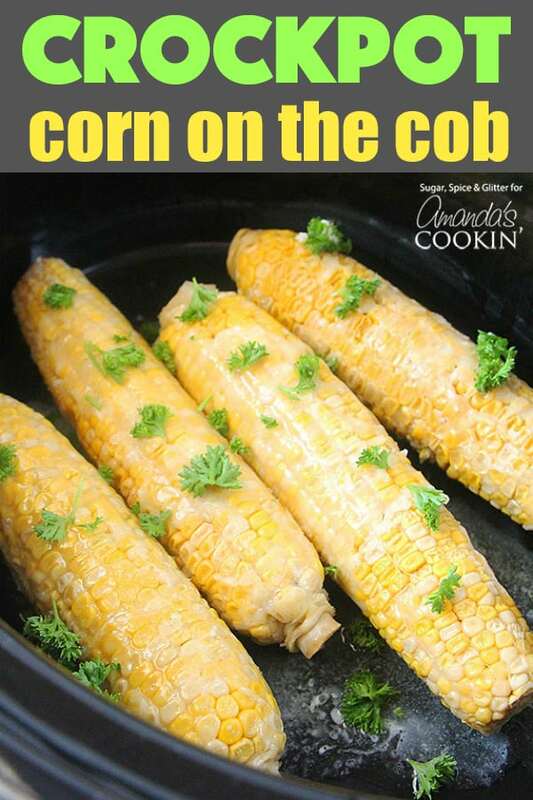 Crockpot Corn on the Cob: make corn on the cob in your slow cooker! I love corn on the cob, but it’s so simple that it sometimes slips my mind when I’m busy preparing more labor-intensive recipes for family get-togethers. This Crockpot Corn on the Cob recipe ensures that this family favorite side dish makes it to the table, plump and full of buttery flavor straight from the slow cooker! 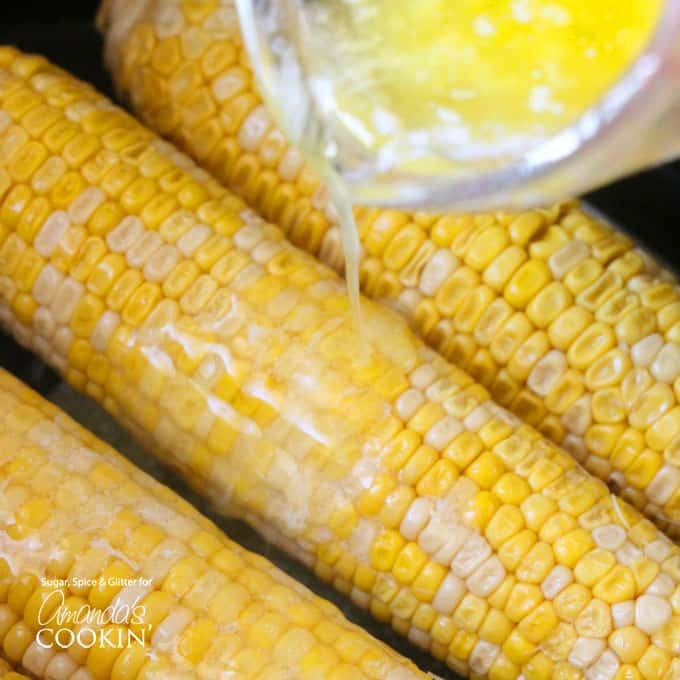 You may be wondering why someone would bother cooking corn in a crockpot, but it really makes a flavor difference – especially if you are used to boiling your corn. 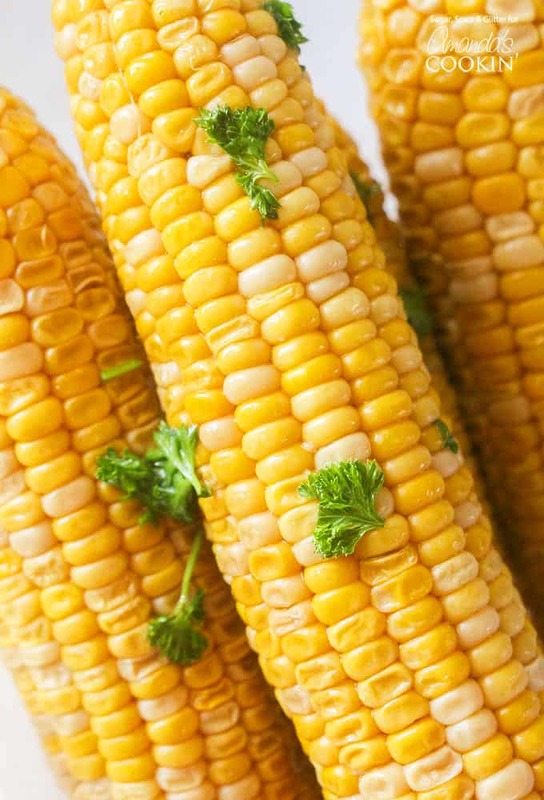 In a slow cooker, you are essentially steaming the corn and not robbing those delicious cobs of their flavor – which gets left behind in the cooking water when it’s boiled. 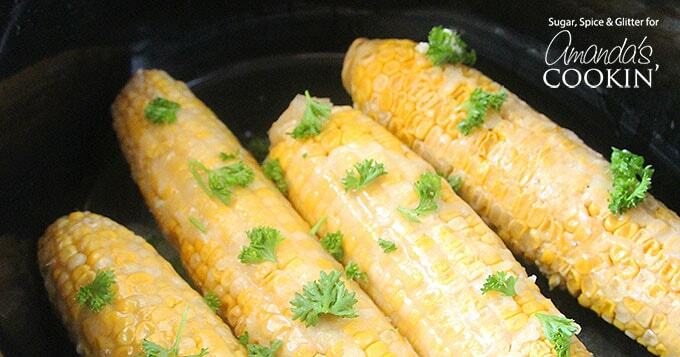 There are actually two ways to cook corn on the cob in the slow cooker: with foil and without. Today I’m showing you how to make it without the foil. Why foil anyway you ask? Wrapping each piece individually in its own foil creates a steam pouch just for that ear. That is extremely handy for when guests or family members like different seasonings.It also eliminates the need for water in the crock. When using foil, I brush my cobs with olive oil then wrap with foil, eliminating the need for melted butter all together. Just place all the foiled corn inside the dry crock and cook as directed below. When cooking is done you can butter and garnish your corn, and leave it to stay warm in the crockpot while you are dealing with other last-minute preparations. It won’t go cold, harden, or dry out – if anything it will allow the corn to absorb more of that butter flavor. Crockpot Mac and Cheese is an all-around favorite for so many. 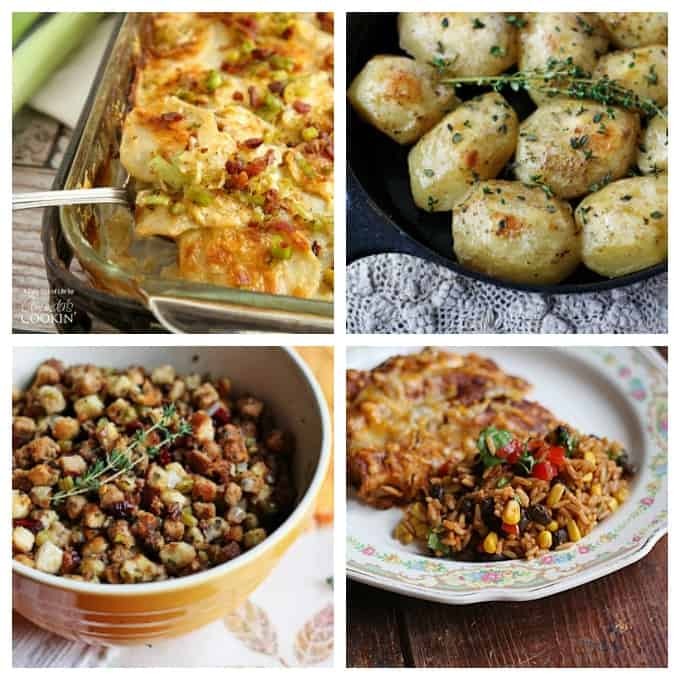 Cheesy goodness straight from the slow cooker, it doesn’t get much easier than that! Potatoes Au Gratin have been a favorite in many households. 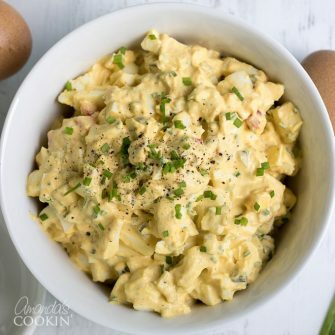 Add bacon and leeks and you have a delicious side dish that everyone will love! Speaking of potatoes, these potatoes are roasted in a cast iron skillet in a savory broth that makes them irresistible. We usually only think of stuffing, some call it dressing, at Thanksgiving. But really it can be enjoyed with poultry any time of year. Try my stuffing with parsley, sage, rosemary & thyme (anyone remember the song?) next time you make it. If you’re looking to add some southwestern flair to your dinner, this Spanish rice with black beans and corn is a great side dish. Roasted Asparagus with Smoky Romesco Sauce is another crowd favorite, pair it up with a meat dish, or serve it as a vegetarian side dish, this recipe is full of flavorful! Cook on high for 2½ to 3 hours. when cooked in the crockpot, does this make the cobs fresher tasting. I live in GA and cob corn is not in season now … whatever is left in the stores is dry and tasteless. We love corn on the cob and anxiously await the growing season every year. PS: I already get your newsletter — LOVE IT! Hi Paula! 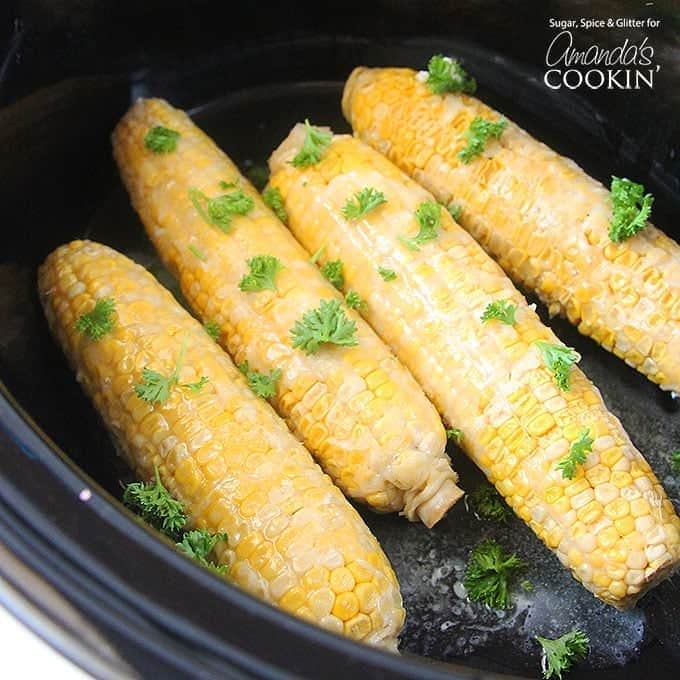 I’m not sure if it would make it taste fresher, but adding the butter or a flavored olive oil to the corn cobs and then wrapping them in foil before putting them in the slow cooker can create an individual flavor steaming packet. That should infuse the flavor into the kernels.